Colonel James Masterton was a well-known member of the British establishment. He was a captain on the side of the government at the time of the third Jacobite rebellion (the '45) and took part in the Battle of Falkirk (1746) which ended in an embarrassing defeat for the British army but the rebels failed to take full advantage of their success. The final outcome of the rebellion was at Culloden where it is said that James Masterton was aide-de camp to the Duke of Cumberland (I have yet to confirm this). If so, he may well have fought against his cousin Francis Masterton who had "come out" for Bonnie Prince Charlie. In later life, James reached the rank of Colonel and became barrack-master for Scotland, based in Stirling Castle. From 1768 to 1774 he was Member of Parliament for Stirling Burghs, a large constituency which included Dunfermline, Inverkeithing and North Queensferry as well as Stirling and Alloa. His London residence was 4 Sackville Street, off Piccadilly. He lost his seat in 1774 after an acrimoniously fought election against Colonel Archibald Campbell. Im sorry that the first news I have to write you should be an acct. of a Retreat but such as it is shall give you the Matters of fact which I had occasion to be ey witness to as Genl. Hawley did me the Honour as make use of me as his Aid De Campe since we left Newcastle, his Aid De Campe Capt. Forbes not being come up. The 17th Inst. Rebels was within 5 miles of our camp at Falkirk, which made us be very allert all night and about morning had accts. of them moving towards us, at 12 before Noon we saw them Marching, and about 3 miles from us, upon which our men all stood to arms our Dragoons mounted and was formed in the front of the Camp in a Moment, upon which the Genl sent me to the Dragoons to March immediately up to him which was on a Hill. I Ordered Genl Munke to follow wt the foot in Two lines. Then the Rebels made towards the left of us to a man ? Rising Ground on the ? of a Hill where they had the Wynd in their Backs which Blaw'd very hard and Rain'd, upon which the Genl. Ordered me to go to Lieut Col Whiteney (who was on the left of the whole as all our Dragoons were in Two lines) to Desire him to file more to the left that the Rebels might not outflank us and make Room for the foot to march up the Hill, upon wh. Lt Col. told me he could move no further for they were a Morrass on his left, and the time I was talking with him the Rebels fired upon our Dragoons about 60 yards Distance (it was then half one hour past 3) upon wh the Dragoons fired and pushed forward as if they had all to Nothing, but in less than a Minute the Dragoons on the left went Galloping down the Hill, fairly ran away, which struck such a panick into our foot, that the whole second line gave way, (wh. was not in fire and am persuaded half the first line did not fire) for such panick God keep me from ever seeing again that our forces was in) the Rebels pursued down the Hill about quarter of a mile and ? Dragoons had very near rode down Genl. Hawly, he Drew his pistol and endeavoured to Rally them but threats and fair words would not do for they never stoped till they got to Camp wh. was a good Mile Distant, Genl. Munke and Brigdr. Cholmondeley continued wt what would stay with them (wh. was only Barrel's Regt. ????????? foot wt Lieut. Col. Stanhope, which was not more than 200 men and some few Remains of other Regts. and with them they kept the whole Rebels in play near one hour & drove them a good way up the Hill, but it being now Dark they retreated down to Ql. Camp, wh. was mostly gone with the Bow ?? ?, it power'd wt Rain, Blew hard, the ammunition all spoiled, so it was thought proper to return to Linlithgow which was Six Miles, next Day it continued Raining our Amunition all spoiled so it was thought proper to return here 20 Miles from the field. And ql Rebels mostly returned to Stirling 6 miles from ql field the part of them stayed in Falkirk qh town where our Camp was, had the Night been fair we had not retreated from our Camp, or had we had two hours more Day light, I believe our Men would have recovered the panick, or had they been 4 Battalions like Barrel's Regt. Its my sincere opinion we had entirely Defeat them, in short the thing will make a Great Noise but in fact we have sustained little loss, for the Highest Computation I can make we have not 300 men killed taken or wounded. Amongst qh killed and missing is Sir Robt. Monro, Lieut. Col. Whiteney, Biggar, Major Lockhart, 5 Capts. and about 8 subs. Liet. Col. Jordan of Cobhams Dragoons was shott in qh Belly the Ball taken out, and I had a 14 guinea horse Shott under me, we lost 7 of our 10 cannon, our cannon could not act, and those Cannon being left, I think was owing to the bad Conduct of Capt. Cunninghame, qh Old Man of qh Train our Capt Cunninghame was Shott threw the Leg. Lt. Semple is since come her wt his Regt and the Scots fusiliers, in my Oppinion we shall march from this in 10 days more, and be in better order than, than we was at qh Engagement had we not moved they durst not to have Attacked us, our Dragoons suffered Greatly Cobhams behaved pretty well, but qh other two Regts. Were I a King I would break them for ane example, for those Dogs will never fight, we have taken prisoner one Major McDonald and Three more Highlanders, & I believe for every Man we had killed the Rebels lost 3, and In ??? we was (in my Opinion) 1/3 more Number than them, they outflanked our left but their Right was not further than the Center of our foot, one thing I must say for thou ???? that they were Drawn up in Extream good order in Two lines And their work in the Center which Composed a Kind of Third line in their rear, their prince as they call him was there and I assure you I saw tham all very plain both from Right to left and am sure was no more 1/3 more, you may lay the Greater Shame to us, but Man could not do more than Genl Hawley did, qh Only fault was our moving to them for they marched so quick got the Advantage of the Ground, and all our foot hung on the Lee of ane Ugly hill like a Hinging pair of Stairs, for none but our Dragoons was on the Top of the Hill, but qh reason of qh Genl. Marching was endeavouring to get the windward & to qh Top of the Hill. However I hope in less than 14 Days to have qh pleasure of writing you of their entire Destruction, for had they been Good for anything, the panick our Troops was in, they might have made Great Advantage but I don't find they have made any, more than our 7 Cannon wh was 2 of 6 pounders, 4 of 4 pounders, & a Galloper 2 Ryals & 2 Can wt. Some powder. I have my own fears of Stirling ?? wh may ???? their Retreat over qh firth, but Genl ??? ?ney will make them fight it Inch, by Inch. Col. Campbell came to Falkirk wt 950 Highlanders qh Morning of qh 10th and took a very good post opposite to our camp and about half a Mile to the Right of the whole Army which hindered a body that they had (I suppose to make an Camp) from Advancing further but am Afraid one Camp of Your Highlanders is prisoners they being on ane Advanced part & by some stupidity had not ??? their body, was expect in 2 days about 1000 more of the ArgileShire Highlanders. 1 James Edmonstoune of Newton, professional soldier; friend of Hume since the Lorient expedition of 1745; Capt., 1744; Maj., 1758; Lt-Col., 1759; retired, c. 1770. A cousin of Lord Bute, Edmonstoune took Lord Mount-stuart (Bute's eldest son) on the Grand Tour, 1764-6. 3 James Masterton of Newton; Capt., 1755; Lt.-Col., 1761. Prior to 1774 M.P. for Dunfermline (see Kay's Portraits, ed. of 1877, ii. 404, n. I). Perhaps identical with Col. Masterton, who died in Feb. 1778 as 'Barrack-master-general of North-Britain' (Gentleman's Magazine, 1778, p. 94). I was born, as I have said, at Ardkinglas. The date was the 21st October (old style), in the year 1745. In my eighth year I was sent to the High School of Edinburgh, and remained there for four years. During that period, I lived with my grandfather, Sir James Livingstone, whose town residence was in the Canongate, a few doors below the church, on the same side. I do not remember any incident of my boyish days worth relating, except a pitched battle which I had with my relation and school-fellow Lord Keith, which was followed in after-life by constant habits of intimacy and friendship. On my return from the High School, I remained for a year at Craigforth, under the charge of a private tutor; and early in the year 1759 I was appointed to an ensigncy in the 51st regiment of foot, commanded by Colonel Brudenel. Soon afterwards I left Scotland, in company with the late Lord Dundas, then about eighteen years of age, on his way to Geneva, to complete his education. In our travelling-party there were also Colonel Masterton, afterwards Member of Parliament for Clackmannanshire, and Muster-master-General for Scotland; and Matthew Henderson, then, and afterwards, well known and much esteemed in the town of Edinburgh. At that time an officer in the 25th regiment of foot, he was like myself on his way to join the army, and I may say with truth, that in the course of a long life I have never known a more estimable character than Matthew Henderson. Signature of the lands of Newton etc. granted to Capt. James Masterton, 23 Feb 1760. 1761 James Masterton 17 Mar 1761 Dep. Adj. Gl. Irel. The king approves of the succession in the Royals on Col. Mastertons retiring, also of the gentlemen recommended for the additional officers to Col. Armstrong and Lord Blandyes regiments, and does not object to the exchange between Lieut-Col. St. John and Lieut-Col. Tennant, if without expense or inconvenience to the latter. His majesty has a due sense of the merits and services of Lord Forbes and colonel Pearson, but has already destined the 18th foot for Sir John Sebright, and the 52nd for Col. Clavering. His majesty also approves of all the promotions recommended in his letter of the 13th, and has ordered a commission for Mr Amos Vereker to be a cornet in the Royal Irish Dragoons, to bear date 1st October last. His excellencies leave of absence, and the peerages, are also transmitted. ...a Letter to Colonel Masterton, Sir Lawrence Dundass's, Arlington Street2. 2 Col. James Masterton (1715-1777) of Newton, Stirling, who had been aide-de-camp to the Duke of Cumberland at the time of the '45, used his influence to get contracts for his friend Lawrence Dundas who made a fortune in the German war. From 1768 to 1774 he sat for the Stirling Burghs in the House of Commons. Namier and Brooke, The House of Commons, 1754-1790, III, 118-119. Sir Lawrence Dundas (c. 1710-1781), first baronet of Kerse, Stirling, and Aske had made a fortune as government contractor for the armed forces in the wars of the 1740's and 1750's. Shelburne arranged for his baronetcy with Bute. He first sat in Parliament for the Linlithgow Burghs, 1747-1748, and after 1762 sat in succession for Newcastle under Lyme, 1762-1768, Edinburgh, 1768-1780, Richmond, 1780-1781, and Edinburgh, 1781. Although governor of the Royal Bank of Scotland from 1764 to 1777, he was famous for his exploits at the gaming table. Namier and Brooke, The House of Commons, 1754-1790, II, 357-361.
b. 9 Sept 1715, 1st surv. s. of John Masterton, Edinburgh merchant, of the Parkmill, Clackmannan family, by Katherine Eedington or Edinton. unm. Lt. 1 Ft. 1742, capt. 1755; lt.-col. 1761 as dep. adjt. gen [I]; barrackmaster for Scotland 1769. As aide-de-camp to Cumberland during the '45, Masterton was in a position to recommend his close friend Lawrence Dundas for any contracts. 'His good sense first suggested the scheme by which the whole of an immense fortune was acquired. His advice if it had been followed would have saved the half of it. '1 While Dundas was making a fortune in the German war, Masterton was serving with his regiment, from which, when it was posted to Portugal, he retired in 1762, remaining in Ireland as deputy adjutant general. Through his Edinburgh relatives, the Lawries, he helped to establish an interest which secured Dundas's return for the capital in 1768. Dundas, in turn, brought Masterton in for Stirling Burghs and obtained for him in 1769 the appointment of barrackmaster. In Parliament he was one of Dundas's '8 or 9 dead votes', uniformly supported Administration, and apparently never spoke. In 1774 after a violent and costly contest he was defeated by Archibald Campbell, whereupon Dundas quarrelled with him, and the petition against Campbell's return was presented in the name not of Masterton but of Sir Alexander Gilmour. God knows where Masterton is (though I hope in a very good place, as he was charitable to the poor and kind to his relations). It was a great shame to you... to drop poor Masterton in his latter days. He was a very honest fellow who had served you so faithfully and was the best friend you ever had; but gout and opposition and their sins are apt to make greater men than you fretful and peevish. 1Anon. pamphlet A Rhapsody by 'A. Freeman' (pub. 9 Sept. 1777). p. 10. DUNDAS, Sir Lawrence, 1st Bt. (c1710-81), of Kerse, Stirling and Aske, nr Richmond, Yorkshire. ...During the '45, with the help of his friend James Masterton, he obtained contracts for supplying the army of Cumberland, by whose favour he was appointed commissary in Scotland, and subsequently in Flanders. ....Disappointed of a seat at the 1761 election, he approached Shelburne, whom he had known in Germany, through his Scots military friends, James Edgar and James Masterton. Edgar wrote to Shelburne, 17 Oct 1761: "I have had a letter from Lawrie Dundas to say that he is very desirous of coming into Parliament under your Lordship's protection...he submits the terms to your Lordship, his object is to get in." Dundas followed this up by a letter to Shelburne from Bremen, 28 Oct. "Col. Masterton wrote me lately he has taken the liberty to inform your Lordship of the disappointment I had met with about my seat in Parliament, and acquainted me how ready you were in offering your assistance with your friends to bring me in upon the first vacancy". Sackville Street must have been very attractive when first built, its width of about 42 feet being generously proportioned to the houses, mostly of three storeys, with fairly uniform fronts of simple design, built of good stock brick with stone dressings sufficient to avoid an appearance of monotony. Though perhaps not in the first rank of fashion, the larger houses in Sackville Street, particularly those on the west side, attracted throughout the eighteenth century the minor nobility, the dowager, the member of Parliament, the senior army officer and the prosperous medical man. 6. Lady Margaret Herbert, 1737–46; Colonel Beauclerk, 1766–7; Baron de Wenzel, 1785–93; Charles Kemble, 1818–20, ? the actor. 7. Henry Fane, brother of the eighth Earl of Westmorland, M.P., 1735–77 (see also No. 8); his son, John Fane, M.P., 1778–97. 8. Lady Hereford, 1749–56; Henry Fane, 1757–62 or 1763 (see also No. 7); General Robert Monckton, 1765–8; the Rev. Dr. Jubb, 1769–80, ? George Jubb, D.D. ; Sir John Nelthorpe, 1783– 1796; Edmund Wigley, M.P., 1802–13. 9. Colonel Handyside, 1743; the Hon. Thomas Leslie (Capt. Leslie), Equerry to the Prince of Wales, brother to the tenth Earl of Rothes, 1752– 1772; Sir Gilbert Blane, physician, 1822–34 (see also Nos. 12, 21, 33). 10. Lord Southwell, second Baron Southwell, 1745– 1747; Admiral Charles Steward or Stewart, 1733–40, 1748–65. 11. Messrs. Barnes and Amyard (Claudius Amyard, principal and sergeant surgeon to the King), 1748–51; Molyneux Shuldham, first Baron Shuldham, 1782–91; Dr. Samuel Glasse, theologian, 1803–11. 12. Dr. Wilmot, 1740–3, ? Sir Edward Wilmot, physician to members of the royal family; Colonel, later General, Studholme Hodgson, 1751–66; Admiral Edward Broderick, 1766–76; Lady Roper, 1776–85; Dr. (Gilbert) Blane, 1786–91 (see also Nos. 9, 21, 33). The information in this list has been taken from ratebooks, directories, the Dictionary of National Biography, G.E.C., Burke's Peerages and The Army Lists. Expresses his grateful sense of the assurances of his good offices received through Col. Masterton. Refers to his letter of the 7th inst. to Lord Suffolk with respect to his occasional absence. "The "letter is rather prolix, but to be explicit it could not well be "otherwise". In the event of its being proposed to appoint the major commanding the four companies to be Lieut.-Governor in his absence, suggests that the appointment should be made out for the commanding officer for the time being. Gives his reasons - Isle of Man. Received the 17th. 2.5 pp. WILLIAM CHRISTIE, and Others, against The MAGISTRATES and COUNCIL of STIRLING, and Others. 'HOSPITAL': No. 3. The administrators of an hospital have no power to make gratuitous alienations. PRIOR to 1637, John Cowan merchant, guild-brother, and burgess of Stirling, by his latter will, mortified the sum of 40,000 merks, to be employed on land or annualrent, for building an hospital or alms-house within the said burgh, and for the entertainment of twelve decayed guild-brethren, actual burgesses and indwellers of said burgh; or at least, so many of them as the yearly rent of the said hospital or alms-house may be able conveniently to sustain within the same. Part of this money his brother and heir Alexander Cowan employed on land; and, upon the 13th February 1637, entered into a contract with the Magistrates and Council, and ministers of said burgh, by which he obliged himnself to infeft the said Magistrates and Council, and their successors, in the lands therein mentioned; and also made over to them certain sums of money, in implement of his brother's settlement; all to be effectually mortified, doted and given by the said Provost, Bailies, and Council of the said burgh, and their said successors, to the foresaid hospital or alms-house, which should be called, in all time thereafter, 'Cowan's Hospital;' and to the preceptor, minister, and poor thereof, under the patronage and government of the said Provost and Council, and their successors, and one of the ministers of the burgh; and he assigned to them the rents and annualrents of the subjects, and sums of money conveyed to them, for the use of the said hospital; and there being still a deficiency of 3400 merks to complete the 40,000 merks, the Provost, Bailies, and Council acknowledge their having received from him payment of that balance. For which causes, the said Magistrates and Council obliged themselves to take down certain houses on the grounds disponed, and to cause build a sufficient hospital or alms-house, with consent of the said Alexander Cowan, for entertainment of the number foresaid of twelve decayed guild-brethren, actual burgesses and indwellers of said burgh, at least so many of them as conveniently the rent thereof may sustain: Of the which hospital, the said Provost, Minister, Bailies, and Council of the said burgh of Stirling, now present, and who shall happen to be for the time, shall, of consent of the said Alexander Cowan, be now, and in all time coming, perpetual and undoubted patrons, with the right of presentation of the beadmen and poor thereof. And the said Magistrates oblige them to dote, mortify, &c. likewise, by the tenor thereof, dote, mortify, and dispone to the preceptor or master who shall happen to be chosen of the said hospital, and to the said decayed guild-brethren who shall happen to be placed therein, and to their successors, masters, and decayed guild-brethren of the said hospital, all and sundry the fore-named lands, &c. disponed by the said Alexander Cowan to the said Provost, &c. together with all other lands, rents, revenues, and others, which shall happen to be acquired hereafter at any time by the said Provost, Bailies, and Council, and their successors, with the fore-named sums of money particularly before assigned to them, with all other sums of money that shall be given, or that belong to the said hospital, except so far as shall be employed on the fabric thereof, that therewith the said decayed guild-brethren may be entertained therein; and in which the said Provost, &c. oblige them and their successors to infeft and seise the said preceptor and master of the said hospital, and decayed guild-brethren thereof for the time, and that by sufficient charter of mortification, containing precept of sasine to be holden of the said Provost, Minister, Bailies, and Council of the said burgh, undoubted patrons foresaid of the said hospital, in free heritage or feu-farm, ac pura elymosina, for ever, for payment to the said Provost, &c. of the feu mails and duties specified in the said Alexander Cowan and his said author's infeftments thereof, above written. Then follows an obligation on the said Provost, &c. to warrant to the said master and poor of the said hospital, all and sundry the foresaid lands and others both general and specific, particularly above written, from all their own acts and deeds allenarly; that is, the said Provost, &c. nor their successors foresaid, have made, nor shall make no other alienation, &c. in hurt or prejudice of the said preceptor and poor of the said hospital, nor of their successors, by any manner of way. They further bind them to deliver to the said preceptor, or master of the said hospital, in name of the poor thereof, all the writs and evidents which they have, or shall happen to acquire, of the forenamed lands and others, to be kept and used by them as their own proper writs and evidents. Likeas, how soon it shall happen the said hospital to be completely built, they bind them faithfully to bestow and employ the whole profits and duties of the fore-named lands, together with the annualrent of the fore-named assigned money, and all other rents and revenues that shall happen to belong thereto, upon the maintenance and entertainment, within the said hospital, of the foresaid number of twelve decayed guild-brethren, &c. and for upholding of the hospital, and all the fabrics thereof. And, for the better government of the hospital, the said Magistrates, Council, and Minister, bind themselves to elect a preceptor and treasurer yearly. In 1709, the patrons of this hospital made a purchase of the lands of Cambuskenneth, holding of the Crown, in the shire of Clackmannan; and the rights thereof were taken in the name of the then preceptor, in whose favour charter under the Great Seal was expede upon the procuratory therein contained, and on which infeftment followed in the person of the preceptor. In execution of this measure, the master of the hospital, in whose name the rights have stood since the date of purchase in 1709, resigned the lands in the hands of the Crown, for a new charter in favour of himself and his successors in office; and having separated the property from the superiority by a feu-right, he thereupon disponed the lands with the burden of the feu, and assigned the Crown charter, on which no infeftment had yet been taken, to the two Messrs Dundass in liferent, and himself, as preceptor of the hospital, in fee, wheupon Messrs Dundass were infeft. And as, by the feu-rights granted as above, certain feu-duties had been taken payable, amounting to L.5 per annum, so the minute of Council bears, that the Messrs Dundass were to pay at the rate of 20 years purchase for said feu-duties, being L.5 Sterling. William Christie and others, under the title of merchants, guild-brethren, and burgesses of the burgh of Stirling, for themselves, and as a committee empowered by the guildry of said burgh, in conjunction with Hugh McKail writer in Edinburgh, therein designed great-grand-nephew, and one of the heirs of line of the deceased John and Alexander Cowan, concurred in bringing an action, containing a variety of conclusions reductive and declaratory, against the patrons of Cowan's Hospital, the two Messrs Dundass, and others; and the first article insisted on was the reduction of the foresaid act of Council, dated 1st August 1772, and dispositions granted, in consequence thereof, of the liferent-superiorities in favour of the Messrs Dundass. Upon a reclaiming petition and answers, the Court disregarded the objections stated to the title of the pursuers; that to McKail's being obviated by written evidence, of his relation to the original founders, flowing from the Magistrates and Council; and as to the title and interest of the other pursuers, it was observed, that this mortification was in 'favour of the guildry,' which gave them a sufficient title; and, upon the merits, the COURT viewed the case in the same light with the Lord Ordinary, that this was a gratuitous alienation, prejudicial to the hospital, and beyond the powers of the patrons; and therefore adhered to the Ordinary's judgment. "And you, Robert Scotland, who have wrote a paper which appeared in the Caledonian Mercury, giving me the epithet of an old military chaplain. This is a name I glory in, having lived fourteen years in the army, where I was always happy, and well satisfied with my situation. You also term me a blustering blunderbuss, which I refuse, and will refer to the whole congregation if that cap does not more properly fit your head than mine. "I have, however, stronger things to say than this. Will any man pretend to maintain but that you lie, by saying that you were a faithful and diligent agent for Col. Campbell, when the contrary can be proven by the evidence of three indisputable witnesses! If you had been a faithful agent for Col. Campbell, why were you so often in the camp of the enemy! A man in the army, if he were found in the enemy's camp, would be shot the next day. Had you acted justly and honestly, and had occasion to be with the enemy of Col. Campbell upon business, you ought to have taken one along with you to prevent suspicion, and to show that you were not doing anything there to hurt Col. Campbell's interest. "Further, when Col. Masterton came to town to entertain his friends, why were you so anxious to dine with him, after it had been resolved among the friends of Col. Campbell that none of them should dine with Col. Masterton? - and why did you write that day to Col. Campbell that he needed not to come to town until the evening? By all which his friends thought the cause in great danger of being hurt, had not his coming happily prevented you. [While Mr. T. was delivering this part of his sermon, R. S. arose several times and told Mr. T. that what he was saying was gross lies and false calumnies, very unbecoming to be spoke from the chair of verity.] If you acted as a faithful agent to Col. Campbell, why did you insist on having everything carried to your mind, and endeavour to get some of Col. Campbell's friends turned out, and those who were his opposites (I will not say his enemies) kept in, and by insisting to bring in those who were either doubtful or in the opposite interest? It is not the duty of an agent to insist on having everything carried his own way. No doubt but it may be frequently his duty to remonstrate, and lay matters properly before his employer; but he ought to leave it entirely to his constituent's prudence to choose what he thinks best.----And if friends of Col. Campbell had not got convincing proofs of your designs to betray their cause, they would not have shut you out from their deliberations when matters came to a crisis, and it was become necessary to have plans formed for conducting the common cause. "Perhaps you will say, What business has all this to do with the PULPIT? But I think it has as much to do with the pulpit as your paper had with the Caledonian Mercury; and those that sin before all ought to be rebuked before all, that others may hear and fear and do no more as wickedly. Wherefore, refrain from lying, etc." Same day came on the election of a member of parliament for the burghs of Inverkeithing, Dunfermline, Queensferry, Culross & Stirling. This election has been warmly contested by Col. Masterton and Col. Campbell. On the day of election Col. Masterton thought proper to drop his interest in favour of Sir Alexander Gilmour Bart. on account, it is said, of a letter, written by Col. Masterton, which is come to light along with other letters of a similar nature. Col. Campbell was returned duly elected. Colonel Hector Munro to be Barrack-Master General in North Britain, vice James Masterton. That DWELLING-HOUSE in CLACKMANNAN, formerly possessed by Colonel Masterton, with Stable, Byre, Gardener's House, and other conveniences, and with a good walled Garden, containing about one and a half acres of land. The entry to be at Whitsunday next. For farther particulars apply to John Borthwick, the factor, at Kerse, Falkirk. LIEUT. 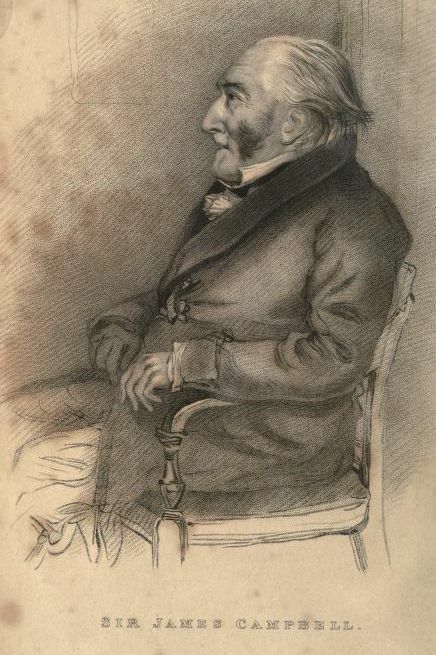 JAMES BALFOUR ROBERTSON (1806) died at Guernsey on the 27th instant. O'Byrne's Biography says:- "James Balfour Robertson, esq. of Inshes, county Inverness (a descendant of David I. King of Scotland), by Katherine, daughter of James Lawrie, esq. of Burngrange and Lappie, county of Kinross, and niece of Colonel James Masterton, M.P. for Stirling, A.D.C. to the Duke of Cumberland at Culloden, fifth in descent from the marriage of Ronald Masterton, of Park Mill, heir male of Masterton, of that ilk, with Marjory Bruce, grand-daughter of Sir David Bruce, of Clackmannan, derived from the Bruces of Annandale, the progenitors of the illustrious Robert Bruce. One of his brothers, Simon Fraser, an officer in the E.I.Co's service, died deputy adjutant general of Bombay; and another, Thomas, filling the same appointment, was drowned in the Lady Jane Dundas, East Indiaman.